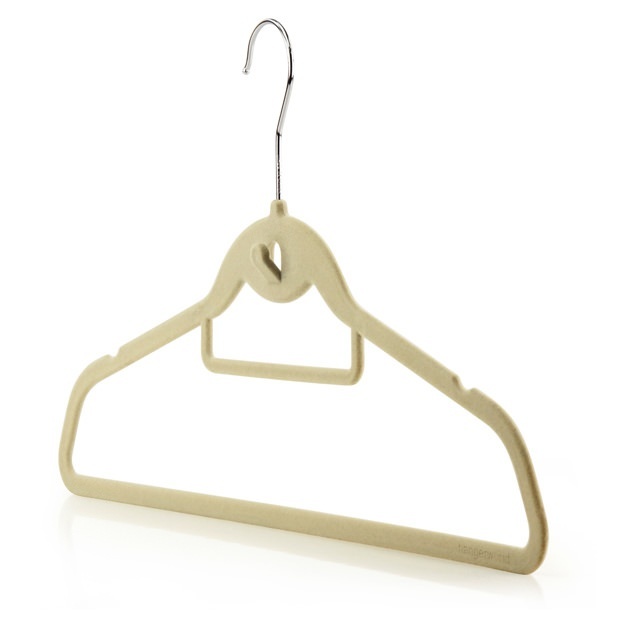 Quality beige flocked coat hangers with trouser bar. Non slip velvet coating prevents garments from slipping onto the floor. Ingenious cascading multi-hook allows hangers to be hung in a chain, saving clothes rail space. Useful incorporated accessory bar for ties, belts & scarves etc. Ultra slim 5mm space saving profile, takes up far less wardrobe space. Smooth contours of the hanger keep clothing in shape which can prevent seams & stitching from deteriorating. Upper notches for hanging clothes from garment straps & loops. Strong metal swivel hook allows clothes to be hung in any direction. Hang shirts, blouses, t-shirts, skirts, dresses, suits, coats & jackets with one multi-use hanger.